NASA's Marshall Space Flight Center image shows on-orbit functions for the reusable X-37 space plane, now under the wing of the U.S. Air Force. The U.S. Air Force's mysterious X-37B space plane is quietly chalking up mileage in space more than two months after its latest launch into orbit. The robotic X-37B space plane soared into orbit atop an Atlas 5 rocket from Florida's Cape Canaveral Air Force Station on Dec. 11. The mini-shuttle's mission is known as Orbital Test Vehicle-3 (OTV-3), since it is the third classified mission under the Air Force's X-37B program. How long OTV-3 will remain in Earth orbit is unknown. The hush-hush space plane mission is officially on Air Force space tracking books as USA-240. The current flight underway has attained one known major milestone — that of reusability. This same vehicle was flown on the maiden voyage in the X-37B program back in 2010. That OTV-1 mission lasted nearly 225 days in orbit and then zoomed back to Earth on autopilot over the Pacific Ocean, gliding down onto a specially prepared runway at Vandenberg Air Force Base in California. The OTV-2 mission, which used a different X-37B vehicle, also made a Vandenberg touchdown on June 16 of last year after remaining in orbit for 469 days, more than doubling its sister ship’s stay. There's a possibility that OTV-3 may not land in Vandenberg. There have been discussions about bringing the space plane down at the space shuttle landing strip at NASA's Kennedy Space Center, next door to Cape Canaveral, as a possible cost-cutting measure. "The possibility of using the former shuttle infrastructure for future X-37B landing operations is still being investigated," Badger said. The X-37B looks a bit like a miniature space shuttle. The vehicle is 29 feet (8.8 meters) long and 15 feet (4.5 m) wide, with a payload bay about the size of a pickup truck bed. 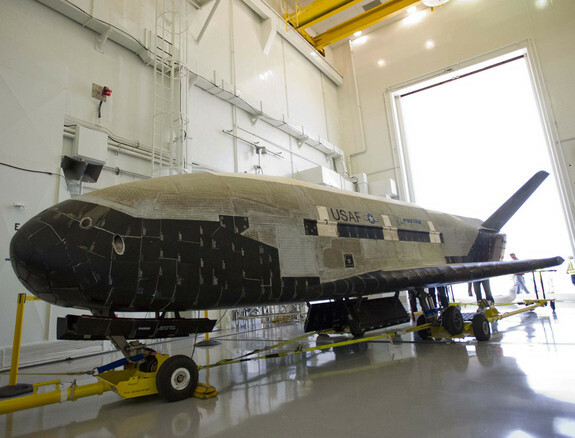 Only two X-37B space planes have been constructed for the Air Force by Boeing Government Space Systems, officials say. Flights of the space plane are conducted under the auspices of the Air Force’s Rapid Capabilities Office. According to an Air Force fact sheet, the Rapid Capabilities Office is working on the X-37B Orbital Test Vehicle "to demonstrate a reliable, reusable, unmanned space test platform for the United States Air Force." Mission control is handled by the 3rd Space Experimentation Squadron, 21st Space Wing, of the Air Force Space Command in Colorado Springs, Colo.
Stretching 29 feet in length and weighing 11,000 pounds, the second Boeing-built X-37B became the longest on-orbit space vehicle on June 16, 2012 when it completed a 469-day mission with an autonomous landing at Vandenberg Air Force Station. While little is known regarding what OTV-3 is toting in its cargo bay, amateur skywatchers offer some insight into the mission. "All does seem quiet," said Ted Molczan of Toronto, a leader in an ever-vigilant, worldwide satellite sleuthing network. 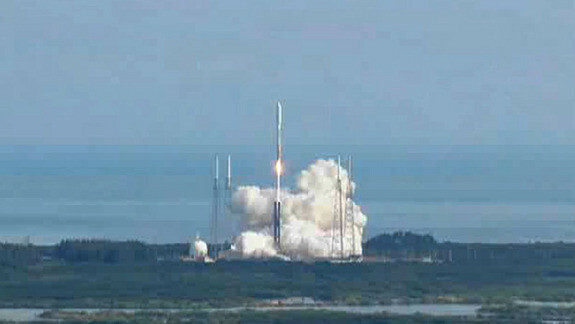 "OTV-3 remains in its initial orbit, maintaining altitude with periodic engine firings," Molczan told SPACE.com. "Unlike the first two missions, its ground track does not closely repeat at the frequent intervals that would suggest an imaging reconnaissance mission." While missions of X-37B remain obscure, the Union of Concerned Scientists (UCS), headquartered in Cambridge, Mass., criticizes the program as a less-than-cost-effective way to conduct space activities. UCS space experts assert that, while the space plane is versatile and capable, there are better, more efficient and more cost-effective ways of carrying out the X-37B's possible missions. "And because it is an Air Force project and its details are classified, the plane has generated confusion, speculation and, in some cases, concern about its actual purpose" a UCS document issued prior to the OTV-3 mission launch said. The X-37B Orbital Test Vehicle is an unmanned space test vehicle for the USAF. The X-37B is based on NASA's original X-37 design, the secretive plane's launch test flight was in April 2010. A second test flight, using a second vehicle - the Orbital Test Vehicle 2 - launched in March 2011. 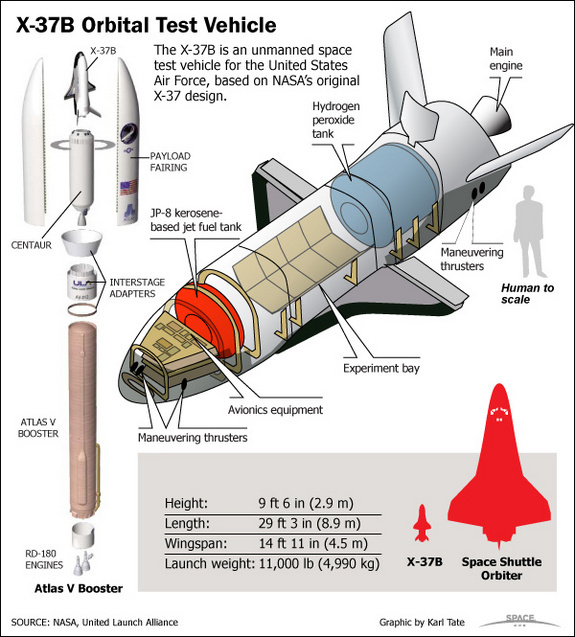 Take a look at the basic facts of the X-37B robotic space plane in the SPACE.com infographic above.